Ooty, Udhagamandalam, or Ootacamund, is the capital of Nilgiris District and recognised as one of the most preferred tourist hill resorts in India. A land of idyllic picnic spots, it was once a favorite summer and weekend getaway destination of the Colonial era and today of India. A major attraction in Ooty is the Ooty Lake, forming a central feature of this town where one can enjoy boating activities. With a pleasant climate ranging between 15°C and 20°C, Ooty welcomes you, all-year-round, to its lavish eco-friendly abode dressed with enchanting tea gardens, cascading waterfalls, and gleaming creeks. 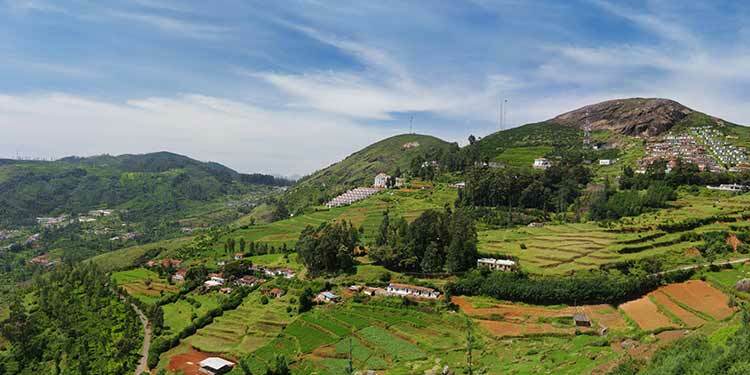 Contributing to make Ooty a haven for nature enthusiasts, this place is soaked in utmost solace and broad hills that beckons you to camp amidst its verdant greenery, or alternatively enjoy a tour to its nearby villages, and tea gardens. There will never be a dull moment to experience as sightseeing in Ooty are aplenty ranging from the famous Ooty Botanical Gardens, Dodabetta Peak, Lamb's Rock, Kodanadu View Point, Wildlife Sanctuaries & National Parks, including nearby excursions to Coonoor and Kotagiri hill stations. You can also enjoy several periodic exhibits and festivals organised in Ooty, of which the Tea and Tourism Festival, the Flower & Vegetable Show, and Makar Pongal Festival, are the popular ones. Ooty can be approached by Road, Rail link, and Air with the nearest Coimbatore Airport just 3.5 hours by car. One can enjoy a hearty Toy Train joyride to Ooty from Mettupalayam, the nearest broad gauge railway head situated close to 46 kilometers from the town. Through a 4-hour journey, you will be introduced to a series of panoramic delights, tea plantations, tunnels and viaducts and much more, sure to make your journey an inspiring visual treat to be remembered for a lifetime. Once you arrive in Ooty, lodgings are available within a range of luxury to budget accommodation options, on prior booking. A visit to Ooty will definitely conquer the dullness of city life, giving you that much needed break within the lap of nature.